I don’t believe in God anymore. The first time I heard those words uttered from one of my closest friends’ lips, I was shaken. Growing up in a deeply spiritual household, I’ve always held the notion that God was quietly watching over everything. The thought that he didn’t even exist truly frightened me. To me, it was as if hearing love doesn’t exist. I’ve never agreed with him, but I’ve always understood where he came from and why he held the position that he did. I’m sure he looks at other war films, such as Saving Private Ryan or Black Hawk Down, and is tragically reminded of the horrifying images he saw half a world away. I can watch a movie. He only needs to watch his nightmares. I would like this same friend of mine to watch Hacksaw Ridge. It is a powerful, emboldening film, one that does not shortchange the horror of war, but equally does not shortchange the power of belief either. This is a movie that does more than strengthen the soldier’s spirit. It strengthens the human spirit. Based on an incredible true story, Hacksaw Ridge tells the story of Desmond Doss (Portrayed by Andrew Garfield), a combat medic during WWII that saved the lives of over 75 American soldiers during the battle of Okinawa. That much I already knew. What I didn’t know was that he exhausted and nearly killed himself saving most of those men in one single night. The number of lives that he saved is impressive enough on its own. The fact that he did it within a 12-hour period makes his story seem impossible. And yet, Desmond Doss did exist, he did save 75 soldiers, and he did do all of it in one night. Even more impressive is the fact that he did so without arming himself with a single weapon. Yes, dear reader: he was a conscientious objector, and he is the only war hero in history to have earned that title alongside a Medal of Honor. To try and verbalize the feelings that the film emotes is impossible. Like other great historical epics, such as Schindler’s List or 12 Years A Slave, it pulls emotion out of you to the point where you don’t feel like you’re watching a movie anymore, and are instead completely immersed in its harsh, uncompromised reality. It’s easy to relate to Desmond Doss because you’re not experiencing the film through the third-person perspective as the viewer: you’re experiencing it firsthand as Doss, seeing the same things that he does while reacting to them in real time. Mel Gibson is no stranger to this sort of storytelling. His previous films, including Apocalypto, Passion of the Christ, and the Oscar-winning Braveheart, each threw our heroes through impossible, monumental, life-changing events that personally challenged each of them as those movies went on. Hacksaw Ridge is a welcome addition to his incredibly impactful filmography. Like each of those films, Hacksaw Ridge finds tragedy in a real-life subject, hammers it mercilessly at our hero, only to see him overcome it with every grit of his teeth, every sweat pouring down his brow, and every grip of his nails digging into the dirt. The fact that this film exists, and that it is done as well as it is, is a testament to Gibson’s skill as a filmmaker. What is most impressive is the fact that this person existed in real life, and that he really did the things we saw him do on screen. How could this have possibly happened? I’m a believer, and I don’t believe the things I saw on the screen. It’s so far-fetching to think about, but the film is done so vividly well that you can’t see it as anything but real. The film exists in this weird space where you want to question everything you’re told, but then as you watch it, you suddenly silence your questions and your disbelief. You stop doubting. You start believing. Garfield deserves equal credit in bringing this man’s story to life. Yes, Gibson is the director in the chair, and his master strokes as an artist is what allows this film to live and breathe. Yet, a movie is nothing without its character, and Garfield performs his role brilliantly. Imagine a character pulled right out of the frames of any other Christian film, professing his status as a believer, hit with some monumental tragedy, then questioning himself and the things that he was raised to believe. To elaborate on this film any further would invite the threat of spoiling it. Go and see this movie. I repeat: GO AND SEE THIS MOVIE. There are films out there that excite us, thrill us, depress us, madden us, scare us, and empower us. Hacksaw Ridge changes us. Even if you do not share the same religious views as Doss, you share the same spiritual views, which is the spiritual power of overcoming. I don’t know if Hacksaw Ridge will change my friend’s view on God. It probably won’t. But it might change his view on life, on the resilience of the human spirit and the things that it can accomplish. 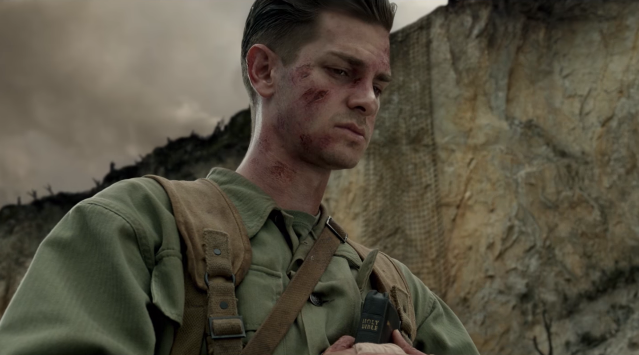 If Hacksaw Ridge doesn’t bring my friend to God, then I pray that it at least brings him to hope.